During the 1940s, when invasion was thought to be imminent, chicanes were put in place on both sides of the Iron Bridge, and on the Exe Bridge, along Bonhay Road and several along Cowley Bridge Road, and around the Clock Tower. No doubt there were many more, but were out of my area. These were made up from two timbers crossed Andrews Cross style, joined to gather by a horizontal timber. The whole bound together by barbed wire, or by coils of barbed wire. Traffic was stopped and the drivers questioned, and identities checked. I remember crossing the Exe Bridge in a bus, when the bus was stopped and a soldier entered – I felt very grown up when he asked for my identity card, and I had it with me. The high path from the New North Road fountain to Duryard, and on to West Garth Road was covered in barbed wire, intersected with sandbag emplacements, behind which were soldiers with machine guns. The BP petrol storage station, in King Edward Street had an armed guard patrolling outside, for most of the war. Peep lane was closed by coils of barbed wire, and entry to Rock Side steps was restricted. On the corner of Hele Road and St Davids Hill, with another very large one high up behind it on the Inland Revenue site. At the junction of Prince of Wales Road, and New North Road. On the left of the entrance to Thomas Hall, in Cowley Bridge Road. High up on the bank above the bus stop at Cowley Bridge and on either side of the railway bridge at Cowley. There were large pill boxes on both sides of Cowley Bridge and on the city side of the Exe Bridge. Concrete cones, cylinders, and cubes each weighing about a ton with an iron hook embedded in the top to assist moving were placed by the side of roads, ready to be moved in position to obstruct tanks and enemy vehicles. These remained in laybys through out the war. Many road, and streets had public air raid shelters, built on the road way and footpath restricting traffic. These consisted of a concrete base about 30 feet by 20, divided to make four small rooms, furnished one side with two tier bunks, and an Elsan toilet, no privacy. There was a central corridor with a door each end. Electric light was provided, but was seldom working for privacy's sake, and for reasons of nefarious activities when there was not a raid on. It was built completely of brick and cement about 8 feet high inside, plastered out side with a reinforced flat concrete roof. There were large ones of this type such as in the centre of Sidwell Street, from the Odeon to York Road. and under the Iron Bridge. Other notable Shelters were under the Civic Hall, Rougemont Hotel Basement, the Catacombs, on the Quay and opposite St David's Station. During a raid patrons in cinemas and the theatre were asked to leave and the programme was stopped. 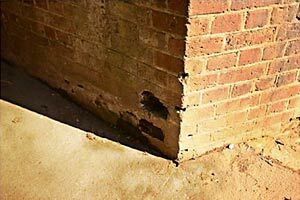 Blast walls were provided free to many house holders. These were built of 11 inch brick and were about 8 feet high and were erected at the rear of the property. Some house's were given extra internal support to large rooms and basements. A steal reinforced table with a wire surround underneath was also available that was called a Morrison shelter. And for the garden there were Anderson Shelters made of thick curved galvanised steel. It involved a lot of preparation, digging a suitable large deep hole, placing the galvanised sheets in position bolting them together and covering with the soil you had dug out. I think these air raid precautions were means tested because we never had one. Most streets had there own Air Raid Warden – ours lived next door. His duties included maintaining blackout restrictions. He would shout, "Put that Light Out" if you showed only a chink. You had to keep a record of all personnel, maintaining gas masks. and adding changes to the gas masks, because of additional dangers. You went to him if you had lost or damaged your gas mask, he provided larger masks as the children grew and gave advice. In a Gas Attack alert he used a rattle. In the early years of the war there were painted panels, out side police and rail stations, libraries and parks. I think they were painted yellow – if they went green there was gas in the air and you put your mask on. You were advised to follow emergence instructions to the letter, with the danger of Butterfly Bombs and UBX. He gave demonstrations as to how to use the stirrup pump which was issued to every house holder. Incendiary bombs only cause a problem when they have something to burn. Explosive incendiaries are a different matter – every house was encourage to have a bucket of water, sand and stirrup pump handy, and a long handle covered shovel on the top landing to deal with the incendiary. We had a plan as to what to do in an emergency and personal evacuation procedure. We had two twin prams preloaded, with ground sheets, blankets and tents. The wardens house had a sign saying "Wardens Post". There was also a Central Wardens Post Called the A.R.P. "Air Raid Precautions" from which he received instructions. The warden had a dark blue uniform with an arm band, he wore a steel helmet, with warden written on it or just W. Some were painted black, ours were all white. He or she, was an important person in war time society. British Restaurants were made available to give a basic meal at a low cost, free from coupons. Exeter had a number including the Civic Hall, St Luke's College, Fore Street Hill, Exe Island and Buller Hall. There were direction signs to all Air Raid Shelters and capacity stated, as well as to Water Tanks. Because there were no street lights, accidents were bound to happen; curbs, and lampposts were painted white, and road obstructions had a small red light shining face down at the base. Emergency water pipes were installed in the gutters, bringing river water from the Exe in case of fire. Where the pipes were joined there was a raised connection, and many legs and hips were broken tripping over them. 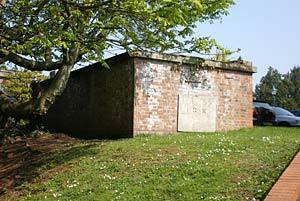 Is this Exeter's last surviving air raid shelter at the Imperial Hotel? Building the shelter in Sidwell Street. Click to enlarge These holes in the brickwork of the Bonhay railway bridge were made to take angle bars that blocked the road at the time of an invasion.